Groan. That’s about it. Just groan. What else can be said? The Kansas State baseball team came to Lincoln riding a nine-game losing streak, if “riding” is an appropriate word. Add to that the fact Nebraska defeated the Wildcats at Manhattan on Tuesday a week ago, and, well, you never know. But the odds seemed to be in Nebraska’s favor. When the Cornhuskers, trailing 4-3, got two on with walks and only one out in the bottom of the ninth with Mojo Hagge and Scott Schreiber coming up, those odds should’ve gone up. In last week’s 11-9 victory, Jesse Wilkening hit a three-run home run in the top of the eighth for the winning runs. And he hit it off Alex Belch, who was again pitching. Except that this time, Belch got Hagge on a pop-up and Schreiber on a ground ball. It was thanks for coming and drive safely on the way home, again. Nebraska struggled from the beginning. Matt Warren, ordinarily the Sunday starter, got the start because the Cornhuskers didn’t play last Sunday, or Saturday. He lasted only two innings-plus, walking two, hitting one, throwing a wild pitch, allowing three hits and three runs, all earned. The Cornhuskers also committed two errors behind him. Offensively, they weren’t much better. Kansas State starter Will Brennan retired the six batters he faced, and Nebraska’s lead-off batter reached base only once. 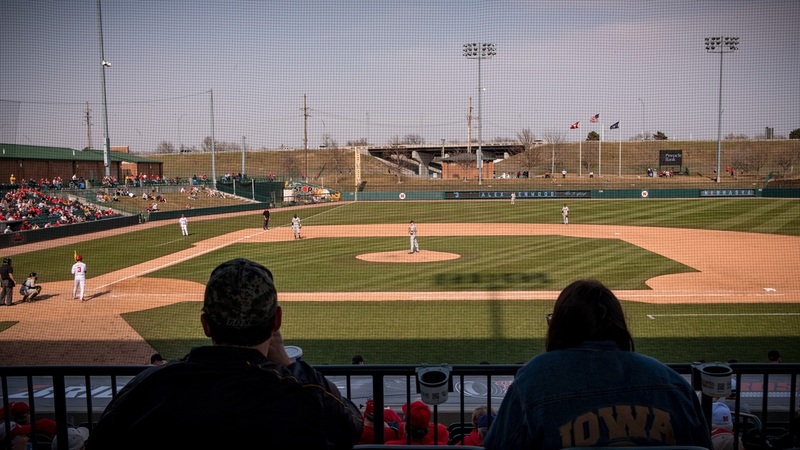 The Cornhuskers have had problems coming off weekend series during the regular season. They are 1-4 in Tuesday games, the only victory last week’s at Kansas State. Bright spots were at a minimum for Nebraska. Relievers Nate Fisher and Mike Waldron pitched well. Waldron retired all nine batters he faced, with only 24 pitches, striking out two. All five of the Cornhuskers’ hits came in two innings, including one for extra bases – Wilkening’s RBI double. Wilkening also had a run-scoring single, as did Hagge. Both were 2-for-4. Schreiber’s 12-game hitting streak came to an end; he was 0-for-5. A positive, of course, was that the game was non-conference. Nebraska drops to 16-18 going into Wednesday night’s game against Omaha at Hawks Field. Erstad said he hadn’t decided on a starter but the Cornhuskers would piece together the pitching with some who haven’t gotten a lot of work. So it should be “very interesting,” he said.